Check out the "supercut" video riffing through Nicholas Cage's wiggy and not so wiggy hairstyles. Read what Kevin Kelly has to say about the so-called "supercuts" genre here. Yes, it's by Yours Truly, and I'm just catching up with the blog posts-- I am actually now about half way through this "loose baggy monster," right after the fall of Smolensk, and on schedule to finish the whole enchilada by December 31. Yes, dagnabbit, 2011 is the year! I welcome fellow readers' comments. As a writing workshop leader I am always telling people to "read as a writer"-- herewith, taking my own advice. Which starts up in January 2012. Follow on twitter @marfamondays. Watch the two trailers, "Where is Marfa?" and -- featuring plastic bags and dancing peas-- "Where the Buffalo Is Marfa?" here. 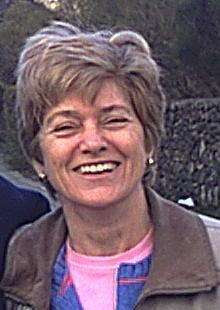 Mystic, essayist, historical novelist Sophy Burnham's new blog. An amazing journalist, hosting amazing true tales by others. P.S. Check out his guest-blog post about this for Madam Mayo. I'm more than half way through War and Peace-- page 709 to be precise. As for blogging about it, I'm more than a bit behind, oh well. Looks like I'll make the year-end resolution to read the whole enchilada in 2011. It took some effort to get started, but it is a mighty and glorious read. ---> Read my Reading War & Peace blog here. Dr Konrad Ratz has translated a profoundly important work for understanding Maximilian's Mexican adventure and gruesome end: The reports of the Prussian Ambassador to Mexico, Baron von Magnus, to Otto von Bismarck. Those who are aficionados of the period will know that Baron Magnus was the only diplomat who witnessed Maximilian's execution in 1867. Dr Ratz found Magnus's reports in the archives in Berlin. . . CONTINUE READING. Just posted, a new podcast of an interview with my amiga, the amazing writer Solveig Eggerz, about her poetic novel, Seal Woman-- and Iceland, writing, publishing, facebook, and more. Listen in on podomatic or, listen in on iTunes. P.S. 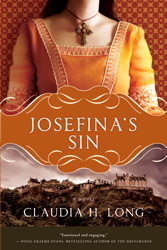 Read Solveig Eggerz's guest-blog, 5 works of historical fiction. 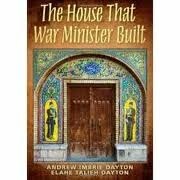 Guest-blogging today is Andrew Dayton, co-author, with his wife Elahe, of The House That War Minister Built, a most unusual epic historical novel that is attracting showers of praise. "In the crumbling days of the Qajar dynasty, Nargess's fate seems sealed as the upstart Reza Khan Shah sends his army to surround her husband's palace. She does not know that the greatest threat lies within! For the next three quarters of a century, Nargess and her family will endure the conﬂicts between a medieval religion and a modernizing population, between emerging nationalism and foreign manipulation. Contending with betrayal, arrogance and moral dissolution, they search for redemption, which only one of them will ﬁnd - on a deathbed in a strange land. An epic saga with iconic characters, abundant cultural insights and surprising historical details, The House That War Minister Built covers the Iranian experience from the end of the Qajar dynasty in the 1920s, into the post 9/11 era." Still married after thirty-one years, the last 8 of which involved writing their epic saga of Iran, they live on a mountaintop retreat on Maryland Heights, near Harpers Ferry. Both are scientists who picked up writing later in life. Andrew was educated at Princeton, then the University of Pennsylvania and Harvard. He has previously published short fiction in The Potomac Review and currently leads a research group in molecular virology on the NIH campus in Bethesda. Elahe was educated at the University of Tehran, then at the University of Pennsylvania and Harvard. 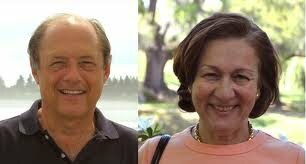 You can find out more about them and the novel at their website www.aidayton.com. In Blood and Oil, Memoirs of a Persian Prince by Manucher Farmanfarmaian, a scion of the country’s most famous family and one time Oil Minister under the Shah examines a considerable chunk of modern Persian history through the prism of oil politics, in which his family played a major role. Much of the information is surprising and counter intuitive. 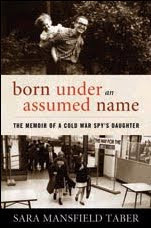 Did you know, for instance, that the hue and cry raised by the British over Iran’s nationalization of their oil company in the 1950s (leading to a CIA-sponsored coup) masked crocodile tears? Did you know that only a decade later President Kennedy’s well-intended populist policies first raised Ayatollah Khomeini to national prominence? Speaking of the 1953 CIA coup, which toppled the democratically elected regime of Mossadegh, did you know that it was led by our man in Tehran, Kermit Roosevelt, grandson of Teddy? Find out more by reading Stephen Kinzer’s All The Shah’s Men, An American Coup and the Roots of Middle East Terror. Operation Ajax was the first time the United States Government toppled a Middle Eastern government. The resulting restoration of Mohammad Reza Shah to the Peacock throne allowed a tyranny that led to the Islamic Revolution in 1979 and much of the Islamic terrorism that plagues the world today. On a lighter note, to savor the visual pleasures of Iran, browse through the splendid Persia, Bridge of Turquoise, a coffee table masterpiece featuring stunning photographs by Roloff Beny, and an interesting forward by Seyeed Nasr on Iranian culture and religion. This book is out of print, but worth tracking down for the photographs alone. Finally, for insight into the tragic general failure of Islam (including Iranian Shiism) to keep up with the West, you can’t miss Bernard Lewis’s What Went Wrong? The Clash Between Islam and Modernity in the Middle East This renowned Princeton scholar examines the multitude of forces that led the once dominant Islam, for centuries the vanguard of world power and learning, to tumble into an abyss of backwardness. Not the least of their errors was one to which we may fall victim ourselves: failure to learn from those we disregard. Recent guest-blogs include Jim Johnston on Mexico City; Gerry Hadden on some spectacularly remote places; and Richard Jeffrey Newman on sites to learn more about the Shahnameh. Apropos of Veterans Day, I'd like to mention a very special video. 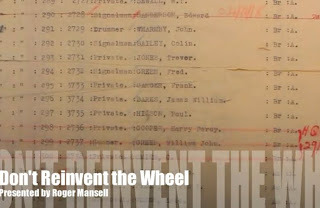 It's a talk my dad, Roger Mansell (1935-2010), was scheduled to give at a conference in September 2010 in England on the history of POWs in the Far East. But he wasn't well enough to travel, so his friend and fellow POW researcher John Hicks recorded it for him at home. It was played at the conference to much applause for his message-- one he always gave, but in this video, very eloquently-- is such an encouraging one. He stresses the importance of saving stories and sharing research. 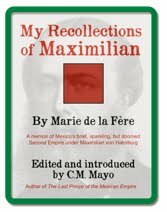 In my own work -- most recently, on Mexico's Second Empire and Francisco I. Madero's 100 year-old "secret" book-- I have also tried to be as generous as possible in sharing. As my dad says in the video, if you don't write it down, it's lost, and if it stays in the drawer, it dies. 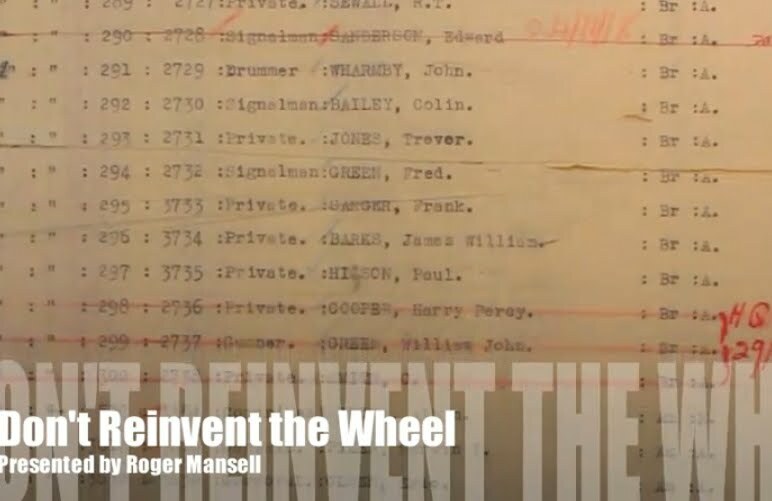 He founded the Institute for Research on Allied POWs of the Japanese, which is being continued by Wes Injerd and Dwight Rider. Watch the video of his talk here. 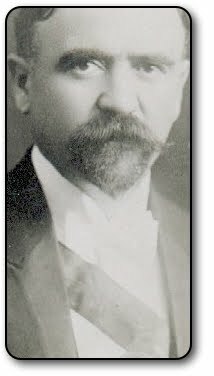 WHO: Francisco I. Madero, leader of the Mexican Revolution of 1910, and President of Mexico from 1911-1913, author (as "Bhima") of the Manual espírita, originally published in 1911. The translator, C.M. 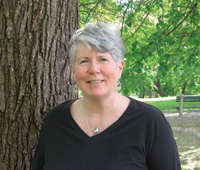 Mayo, is author of several works on Mexico, most recently, The Last Prince of the Mexican Empire (Unbridled Books, 2009) which was named a Library Journal Best Book 2009. 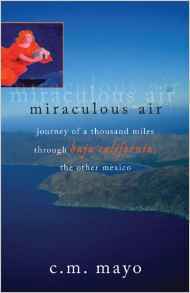 Mayo is also editor of Mexico: A Traveler's Literary Companion (Whereabouts Press, 2006), a portrait of Mexico in the fiction and literary prose of 24 contemporary Mexican writers. WHAT: The first English language translation of Manual espírita as the Spiritist Manual. WHY: This year marks the centennial of this book which is, in the words of C.M. Mayo, "an essential work for understanding Madero, the Mexican Revolution of 1910 and his presidency." WHERE: Cyberspace, space, and Mexico City. Space: Madero claims in his book that that is where we all end up, so maybe that's where he is. Mexico City: C.M. Mayo's office. WHEN: The book is published today, 11-11-11. 2011 marks the book's centennial. I will be giving a lecture about this most unusual book on Thursday November 10 as part of the "Author's Sala" reading series in San Miguel de Allende. Click here for more about that. Apart from its extraordinary content, and the fact that Madero's Spiritist Manual is one of the earliest Spanish language manifestos of this new religion, what stands out about this work is that it was prepared precisely during the brief period when Madero's political career was rocketing to its apex: he was campaigning throughout the country for the Mexican Presidency, then fighting the Mexican Revolution both in Mexico and, variously, from exile in Texas and New Orleans; and then, running again for the presidency— which, later in 1911, he was to win. 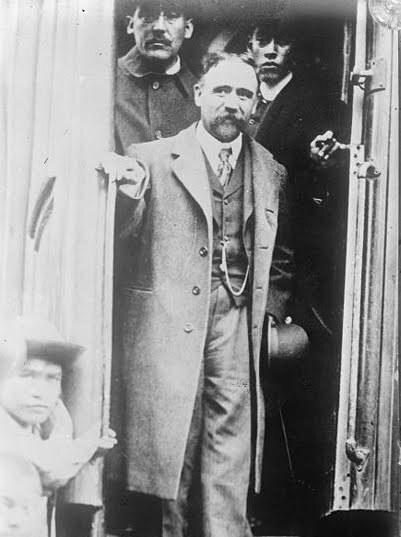 As Mexican historians Enrique Krauze, Yolia Tortolero, Alejandro Rosas and Manuel Guerra, among others, have emphasized, Madero's Spiritism undergirded his political philosophy and actions as candidate for the presidency, as leader of the Revolution, and as President, many of which were incomprehensible to and/or misinterpreted by both his supporters and his adversaries. For this reason, the Spiritist Manual is a fundamentally important work for anyone who would study Madero and the Mexican Revolution. It is also a vital work in the history of both Spiritism itself and modern gnostic Christianity. 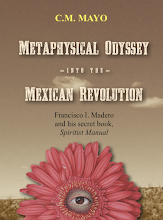 Whatever one's personal beliefs may be, it would be intellectually naïve to dismiss Madero's Spiritism as mere superstition, as most people who first hear of it and indeed, most of his biographers, do. Spiritism emerged in a context of the mid- to late 19th century's far-reaching scientific experientation; moreover, it has its place alongside other religions that emerged in the same century, among them, Christian Science, Mormonism, Spiritualism, and Theosophy. >> Q & A here. After publishing so many books the old-fashioned way, it has been such a strange experience to publish a book first as an e-book. This afternoon, I caught a typo after it was uploaded onto Kindle, which I fixed immediately, and Kindle registered the change within the hour. Anyone who has published (print) books knows that stomach-churning, wide-awake-at-3-am anguish about typos. (No matter how many times and how many people check it, there is always a typo, or thirty-nine.) What a luxury it is to be able to make corrections! And another ginormous change: I couldn't-- and I shouldn't-- give a squished fig about manoevering this book into brick-and-mortar bookstores. Not that it doesn't have readers, but because it's so unusual, and very specifically Mexican, I don't think it would get far into ye olde agent-house-distributor-store-shelf labyrinth-o-rama. So what I want for this book are the right "tags" for google searches and the like. I spent two hours this evening going over the book's entry on amazon.com and this newfangled shelfari.com thing. What a world we've plopped into! In publishing, as in so many other areas of the economy, wierdly, it's becoming drastically constricted even while opportunities are dramatically expanding. But yes, there will be a print edition, as well as an iBook and Nook edition of the Spiritist Manual. Stay tuned. Just look at these pictures... of Michael Aaron McAllister's studio... pure order, plus pugs! 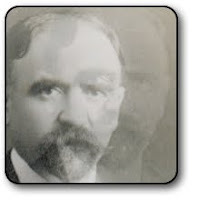 Working on the website for the Spiritist Manual, my translation of Francisco I. Madero's 1911 secret book, Manual espírita. Read all about it here. 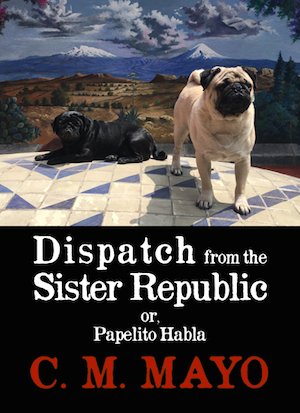 I'll be presenting and discussing my translation of this most unusual work in San Miguel de Allende next Thursday November 10th at the Author's Sala reading series. So, I started War and Peace. Again. Dagnabbit, 2011 is the year! 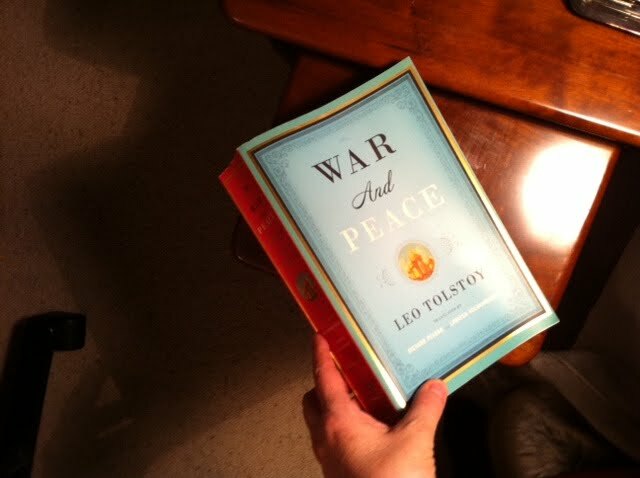 I'll be posting the first blog about that later this evening at the Reading Tolstoy's War & Peace blog. 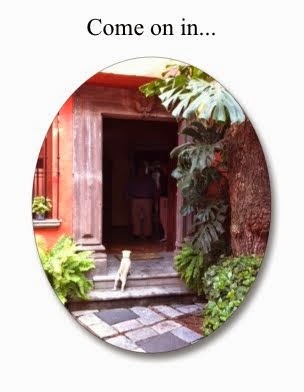 For those of you who follow the Maximilian ~ Carlota blog, the Tuesday update is on-line. No, I don't blog every day. Just Mondays here, some Tuesdays at Maximilian ~ Carlota (that's to share my research on the Second Empire /French Intervention of the 1860s) and, from now through December 31, the Reading Tolstoy's War and Peace blog. I aim to finish by December 31. So what happened to the Wednesday guest-blogs? Well, never say never. But reading War & Peace and preparing the translation of Francisco I. Madero's secret book of 1911, are keeping me more than busy. 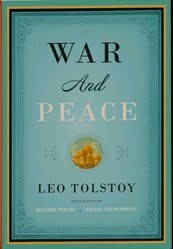 Read all about it over at the Reading Tolstoy's War & Peace blog. 2011 is the year. Born in New York City, Jim Johnston grew up in the woods of New Hampshire. After studying architecture at the University of Virginia and graphic design at the School of Visual Arts, he worked as a professional artist and potter in New York City for 27 years. He moved to Mexico in 1997, where he continues working as an artist and writer. A few years ago, I was fortunate to make his acquaintance through our mutual friend, the writer Janice Eidus, and I've been a fan ever since. 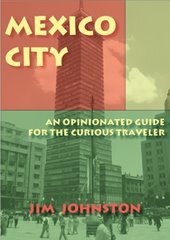 I follow and warmly recommend his blog, Mexico City: An Opinionated Guide, which has the same title as his book. If you're going to visit Mexico City or, especially, if you happen to live here, get your copy from amazon.com. My first visit in 1989 to Mexico City's Centro Histórico was scary. Teeming with manic energy in the daytime, the streets became eerily empty at night. Scars from the 1985 earthquake were evident: tall buildings stood abandoned, gaping holes in the pavement defied you to pass. There were rumors of thieves lurking in doorways and kidnappers prowling in taxis. But as a rule, I like any town that's more than 700 years old and still cookin’. So, of course, I fell for Mexico City, hook, line and molcajete. Mexico is a city that wears its age well. It’s got Aztec splendor and ruin, Spanish majesty and bombast, 50’s modernism, quirky time-warp shops, smoke tinged cantinas, excellent museums, and street life that never stops. In the past five years, the Centro Histórico of Mexico City (A UNESCO World Heritage Site) has been transformed. It's busy night and day, and looking better than ever. There are increased security measures, new paving and lighting; hundreds of old buildings have been plastered and painted (gracias a Carlos Slim). New museums, hotels, restaurants, outdoor cafés and shops have opened. Several streets are now traffic-free pedestrian zones (check out 5 de Mayo, Motolinia, and Regina). You can now ride your eco-bici to the centro. New bars and dance clubs are drawing young crowds on weekend nights. It seems like every time I visit (about once a week) I see something new. But one thing hasn't changed-- the intense level of energy on the street, which can excite and exhaust in equal measure. What to do? I like to take my feet off the ground. Here are a few tips for keeping above the fray--5 places in the Centro Histórico that are above street level, semi-hidden places I’ve discovered over the years that you are sure to enjoy. Go up to the 8th floor of the Sears store, just across from the Palacio de Bellas Artes. The coffee is good and the view is great. Take the elevator to the very top of the Palacio de Bellas Artes (separate ticket required). The changing exhibits on Mexican architecture are OK, but the real treat here is the surprising view you get of the building itself. Upstairs, this ‘world of cakes’ is one of the city’s great surreal spots. Bolivar #27) Above the venerable Borcegui shoe store is this entertaining mini-museum. (Museo de la Ciudad, Pino Suarez #30 at El Salvador). Tucked away on the second floor of this exquisite colonial mansion is the former studio of Joaquin Clausell (1866-1935), a Mexican impressionist painter. For years he used the walls of his studio as a sketchbook, and the result is a delightful mural of overlapping paintings and sketches. Above and beyond the Centro Histórico you can tour the major attractions in Mexico City on the Turibus. The open top deck affords great views and a wonderful feeling of being above all the hustle and bustle. Click here for information. 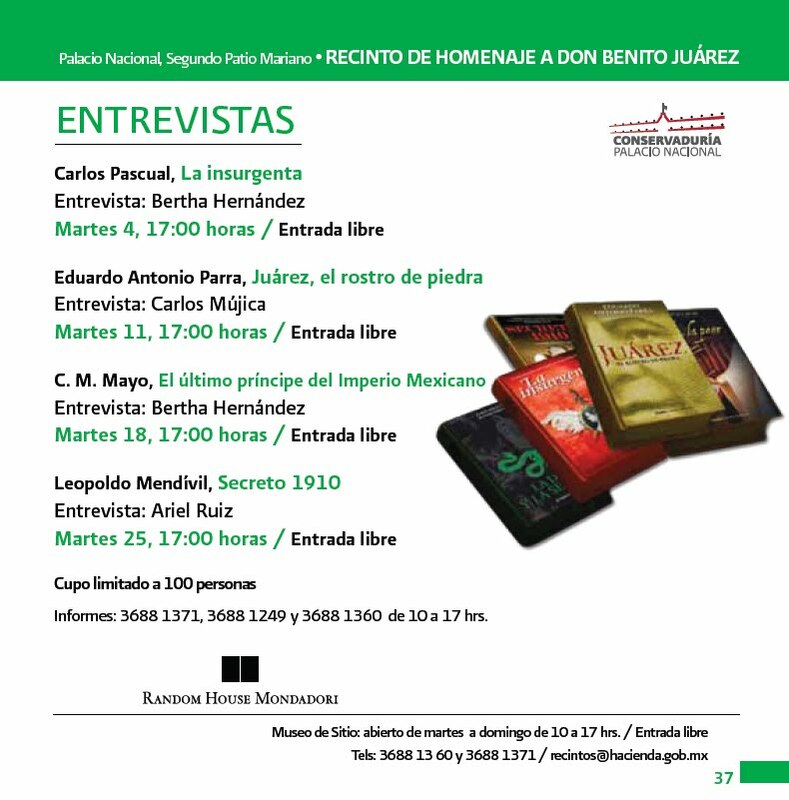 Tomorrow, October 18th 5 pm, I'm doing an unusual event for my book, the Spanish translation (beautifully translated by Agustín Cadena), El último príncipe del Imperio Mexicano: a live interview by Bertha Hernández in the National Palace (Palacio Naciona), as part of a series hosted by Random House Mandadori and SHCP about the historical novel of Mexico. All events are free and open to the public. ---> Visit the archive here. 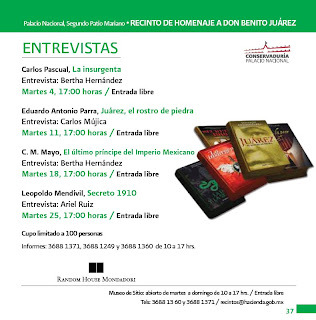 Some news: on November 10 as part of the Author's Sala reading series in San Miguel de Allende, I'll be reading from and discussing my translation-- the first into English-- of Francisco I. Madero's secret book, Spiritist Manual. Yes, Francisco I. Madero, the leader of the Mexican Revolution of 1910 and President of Mexico, really did write this book with the pen name "Bhima," a character in the Hindu holy book, the Bhagavadgita. 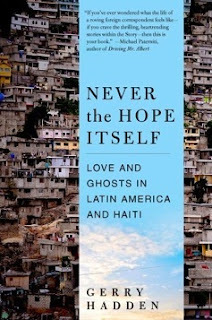 My website for this book is still under construction, but visit again soon for extensive Q & A, resources for researchers (bibliographies and much more), podcasts, videos, and excerpts. I'll be updating this blog post with updated links shortly. WHAT PROMPTED YOU TO START PODCASTING? I started podcasting back in 2009 because I wanted to make available my lecture at the Library of Congress about the research behind my novel based on the true story, The Last Prince of the Mexican Empire. The last prince was, in fact, Agustin de Iturbide y Green, grandson of Mexico's first emperor, Agustin de Iturbide. Because the story takes place in Mexico during its Second Empire or so-called "French Intervention," one might very naturally assume that my archival research would be primarily in Mexico. But in fact the Library of Congress has the main archives, that of the Emperor Iturbide (first Emperor) and the Iturbide family. Mexico's second Emperor, Maximilian von Habsburg, has his archive in Vienna and, though I did visit that archive, fortunately for me, there is a nearly complete copy at the Library of Congress. Anyway, I explained all of this is elaborate detail in my lecture, now a podcast, which you can listen to here. HOW DO YOU MAKE A PODCAST? There are many ways, and I won't bother count them, but I can tell you, I find it very easy to use Apple's "Garage Band" program. I usually just talk into my iPhone's dictation app and take the mp3 file from there. I am sure professional sound engineers would be horrified. Oh well! 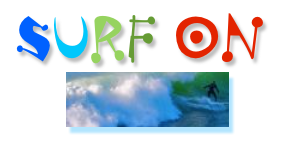 If I want to add music, I buy clips at royalty-free sites such as istock.com, uniquetracks.com or Music Bakery. HOW DO YOU GET A PODCAST ONLINE? Again, there are many ways, but the one I like to use is podomatic.com. I offer the feed at iTunes. Next year when I start up my Marfa Mondays Project, I plan to also add those podcasts to a youtube page. Stay tuned. 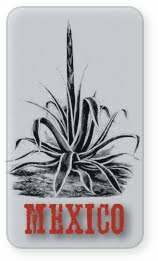 *****UPDATE 1/16/2012***** The Marfa Mondays Podcasts have launched. Read all about it and listen in here. WHY ARE YOUR PODCASTS FREE? As they say, information wants to be free. 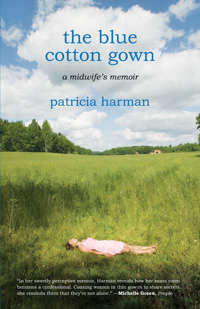 And well, many of my podcasts (such as this one), are, quite frankly, intended to help promote my books and workshops. Others are for my writing students-- a gift to them. 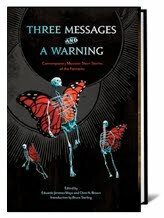 Others, such as "Conversations with Other Writers," are just fun to do and I hope people enjoy them. Podcasting is still very new to me. Just like blogs and youtube channels, there are so many that it takes some time to sift the (alas) few grains of wheat from the Himalayas of chaff. A few podcasts I am delighted to have found are NPR's (and the iPad app lets you put together a playlist); Rice Freeman Zachary's Notes from the Voodoo Lounge; James Howards Kunstler's; and Dr Rita Louise's "Just Energy". 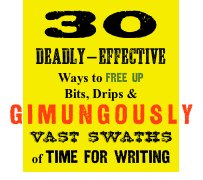 The occasional podcast series on creative writing continues. Just posted: How to Break a Block. Several podcasts are coming up on various subjects, including conversations with other writers. Check out my main podcast page here. >I'll be teaching "Techniques of Fiction" at the San Miguel Writers Workshops and also in Mexico City this winter. Click here for my schedule.